The Americans with Disabilities Act (ADA) is a comprehensive civil rights law that protects people with disabilities. It was signed into law in 1990 and its provisions were expanded under the ADA Amendments Act of 2008. In 2010, the Department of Justice released a revised set of regulations for service dogs with respect to title II (state and local government services) and title III (public accommodations and commercial facilities) of the ADA. These regulations address the rights of service dog handlers in almost all public spaces. There are certain other laws that are applicable in specific situations, such as the Air Carrier Access Act of 1986; the Fair Housing Act; and the Rehabilitation Act of 1973 (which, in part, addresses service dog handler access to any program or activity receiving federal financial assistance). However, the ADA is the law that governs most public interactions with service dog teams. Specifically, the ADA currently defines service animals as “dogs that are individually trained to do work or perform tasks for people with disabilities.” (In certain circumstances miniature horses are also considered service animals but that is beyond the scope of this article.) This is the ADA definition of a service dog in its entirety. The ADA goes on to provide examples of tasks that a service dog can perform, including “calming a person with post-traumatic stress disorder (PTSD) during an anxiety attack.” And yet, service dogs for people with PTSD are often mislabeled as “emotional support animals” (ESAs), which are not covered by the ADA. 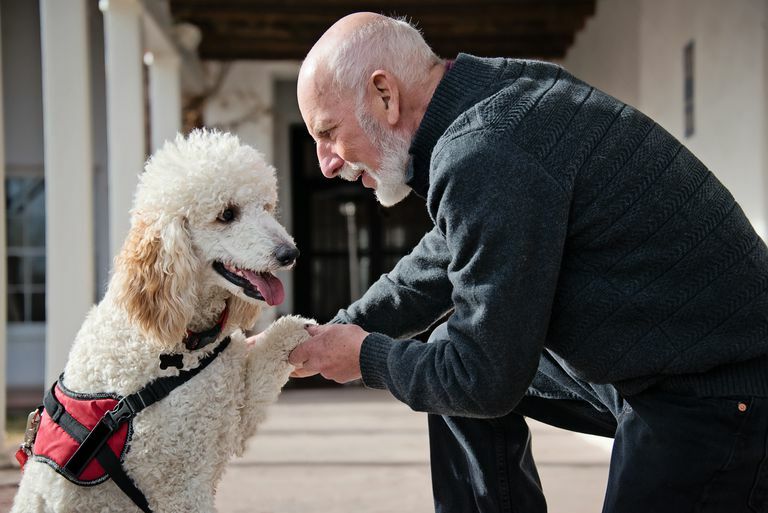 The ADA expressly distinguishes between the two types of dogs, noting that ESAs only provide comfort or emotional support, whereas service dogs have been specifically trained to perform disability-mitigating tasks. While the public has become accustomed to seeing service dogs assist people with visual impairments, there remains much ignorance when it comes to service dogs that assist people with other disabilities, especially those with “invisible” health issues—including PTSD. What Is a PTSD Psychiatric Service Dog? This list is only a representative sample, as each person’s experience with PTSD is different and therefore each service dog’s responsibilities are unique. Regardless of what specific tasks a service dog performs, once it can reliably perform at least one disability-mitigating task, it is considered a service dog, and the provisions of the ADA apply and need to be enforced. Any state or local law that attempts to countermand, or make more restrictive, any provision of the ADA is essentially unenforceable because when state or local laws do not align with federal law, federal law takes priority. However, state police officers are only charged with enforcing state, not federal, laws. Therefore, if an establishment refuses a service dog team entry, and the situation is not covered by existing state laws, the only recourse available is to file a complaint with the US Department of Justice, or file a suit in federal court. If there are state laws in place to protect the rights of service dog teams, it is possible that the employee or establishment has in fact committed a misdemeanor and can be fined. This is why knowing applicable state laws, as well as the ADA, is imperative. Service dogs in training (SDITs) are not covered by federal law, but many states mandate that SDITs are afforded the same protection as their fully trained counterparts. However, the laws sometimes only address specific disabilities, often excluding PTSD and other psychological conditions. Additionally, some of those laws only cover service dogs trained by state accredited organizations, not owner-trained service dogs (OTSDs). Where Might Service Dogs Be Precluded Under Federal Law? As per the ADA, service dogs are allowed to accompany their handlers into essentially any space that is open to the public, including restaurants and grocery stores (even if state or local health codes prohibit animals on the premises). Service dogs are even allowed into hospital exam rooms and patient rooms. The only exceptions to full public access would be areas that the dog’s presence would compromise the health and safety of others, such as hospital operating rooms and burn units where a sterile field might be negatively impacted by the dog’s presence. Service dogs may also be excluded from certain areas under the “fundamental alteration” clause of the ADA, which states that if a modification “would fundamentally alter the nature of the goods, services, facilities, privileges, advantages, or accommodations” provided by the business entity, the business does not need to change its policies. For example, a consistently barking dog would fundamentally alter the services provided by a movie theater or concert hall. At that point, an employee may ask that the dog is removed. However, an employee may not preemptively bar entry to a service dog team based on the concern that the dog might bark. Service dogs may also be required to leave if they are not housebroken, or if they are “out of control” and the owner has not effectively gained control of the animal. Neither fear of dogs nor allergies to dogs are acceptable reasons to bar a service dog team from an establishment. In the case of a severe allergy and a shared space, accommodations must be made for both parties, separating the two as much as possible. The “no pets” signs in establishments do not apply to service dogs as they are not pets. Establishments may not cite the “right to refuse service” as an excuse to refuse access to service dog teams any more than it could invoke it to refuse service to a person based on race or gender, as people with disabilities are considered a protected class. Is the dog a service dog? Staff members are specifically prohibited from asking about the handler’s disability or demanding that the service dog perform any task it is trained to do. The handler is not required to provide an exhaustive list of all tasks that the service dog can perform; naming a single task is sufficient. Further, the ADA specifically states that employees cannot require “medical documentation,” “a special identification card,” or “training documentation.” That means that a service dog does not need a card, a tag issued by a state or local authority, a vest or any other visibly identifying paraphernalia to be allowed access. Requiring any of these items is inconsistent with the ADA. Is Equipment Required for Protected Use of a Service Dog? The only equipment that is mentioned in the ADA is a leash, harness, or tether. And even that is dependent upon the handler’s specific needs. If a leash, harness, or tether interferes with the service dog’s ability to perform its tasks, a handler can control the dog through the use of voice or hand signals or other appropriate methods. While service dog handlers may anticipate encountering workers who are unfamiliar with the provisions of the ADA, ignorance of the law is not an excuse for discrimination. Service dog handlers have a responsibility to keep control of their well-behaved service dog; those who operate public accommodations have a responsibility to know the laws regarding service dog teams and to permit them access as outlined in the ADA. Could You Recognize Destructive Anger in PTSD? Should You Meet With a Psychologist or Psychiatrist to Treat PTSD?